"He lost the horse, he can help me get him back." Stand up and television comedian Bill Cosby makes his feature film debut in E.W. Swackhamer's Man and Boy in 1971. Cosby had made history in the mid-1960s as the first black actor to get equal billing in a prime time television series opposite Robert Culp in I Spy, but unlike many of his contemporaries, refrained from using race as a focal point in his stand up routines. 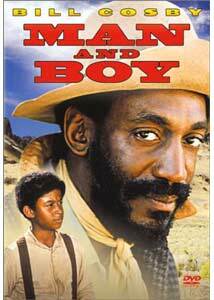 Man and Boy marks a departure, offering Cosby's talents as a dramatic actor in this racially-charged western, set in the Arizona frontier. Caleb Revers (Cosby), a Union Army Civil War veteran, is trying to make a new life for his family with the fourteen acres of land he has earned as a soldier. After inheriting a neighbor's horse he had saved from death, Revers begins to work his boulder-laden dustbowl of a farm with help from his wife and twelve-year-old son, Billy. His bigoted neighbors resent a black man getting ahead in life, despite his service in the army. When Billy loses the horse on a trip into town, he and his father set out to reclaim their property, but in the process face numerous dangers and obstacles. While the racial tensions are palpable, the characters that Revers and his son encounter stretch things a bit much, among them an overly amorous widow (Shelley Morrison) bent on gaining a new husband, and notorious black outlaw (Douglas Turner Ward as Lee Christmas) who, although having stolen his horse, tries to enlist Revers' help in his flight from justice. Where most of what came before it was excuseable, the setup for this sequence defies logic, as the boy inexplicably abandons his unconscious father, and takes up with the outlaw. Then, after being jailed for trying to steal a different horse, Revers ends up in a gunfight, which breaks midstream for a musical interlude. Man and Boy plays more like a matinee TV movie than a theatrical feature. There is plenty of drama as Revers tries to capture wild horses, dukes it out with a former rival, attempts an escape from the custody of a vengeful sheriff or tries to rescue his son, but the situations are a little too contrived to be believable, to the point of bordering on absurd. The performances are fair, but nothing spectacular, hampered mainly by a lackluster script and adequate, but uninspired directon. While interesting for Cosby fans from a historical perspective, Man and Boy is a pretty run of the mill film that, without its star, would be forgettable. Image Transfer Review: Presented in an anamorphic widescreen transfer, Man and Boy looks pretty good for its age. Colors are nicely saturated, detail is good, and black levels appropriate. A couple of places were a bit dark, and there is also some haloing at times. Film grain is abundant though varies by scene, but for the most part looks fairly natural. There is plenty of dust and dirt present in the print, but defects are relatively minor. Audio Transfer Review: The English soundtrack is presented well, with no glaring deficiencies other than those in the source. Dialogue is clean and easily understood, there is a little edginess in a couple of places, but nothing major. There isn't anything really exceptional here, but it does the job. 3 Other Trailer(s) featuring Buck and the Preacher, Cat Ballou, Cowboy. Extras Review: The only extra features are trailers for Buck and the Preacher, Cat Ballou and Cowboy. Man and Boy is a pretty average western adventure, with a fairly heavyhanded and stereotypical racial approach. While it's interesting to see Cosby take on a dramatic role, apart from his presence, there is little to recommend here. A rental at best.